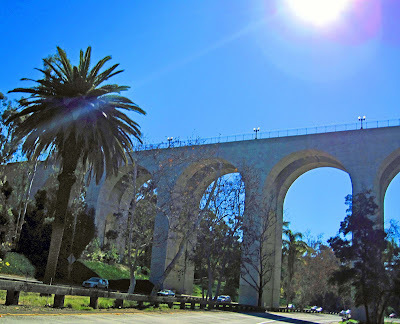 The Cabrillo Bridge was constructed in 1912-1914 for the Panama California Exposition in Balboa Park. 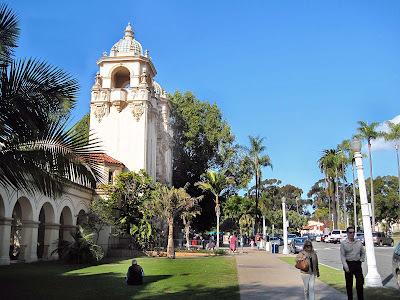 The 120 ft. high structure spans the Sixth Ave. side of the park with the California Quadrangle. Hand labor did most of the work. Soaring scaffolds rose from the canyon floor as workers placed steel reinforcements and built wooden forms for concrete. 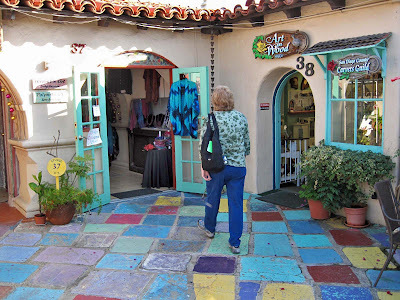 A collection of unique and historic Spanish-tile roofed shops are used by resident working artists including painters, sculptors, metalsmiths, jewelry designers, clay artists, gourd artists, photographers, printmakers, fiber artists, basket weavers, mixed-media artists, glass artists, and more. It is a wonderful place to explore. Learn more here. 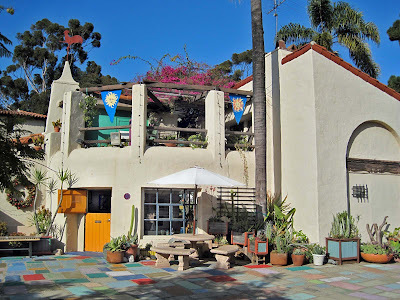 Beautiful art glass guild creations for sale at Spanish Village Art in Balboa Park. The Tea Pravilion near the entrance to the Japanese Friendship Garden offers a wide range of delicious loose leaf teas for a spot of rest. This symbol of our friendship with Japan was built in 1915 during the Exposition. Yokohama is our sister city in Japan. Our garden is called San Kei En meaning water, pastoral and mountain. Our garden honors our ties with the San Kei En garden located in Yokohama. This plaque, located near the tea pravilion entrance, remembers our friendship with a song. 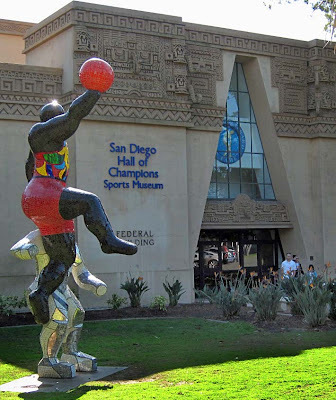 This giant horticultural delight, an interesting find during our Sunday walk in Balboa Park, is located near the Hall of Champions. The blooms are cataloupe size. Anyone know what it is called? 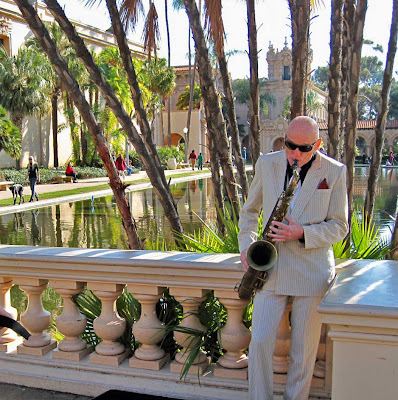 One of San Diego’s top restaurants is conveniently located right in the middle of Balboa Park. Prado Restaurant is just off the main hub inside this courtyard. It offers a welcome break, great service and delicious food. Georgia O’Keeffe said “Most people in the city rush around so, they have no time to look at a flower.” She painted Red Canna in the early twenties to help people see them “whether they want to or not.” My daughter took this picture in Balboa Park when we all went to see the Georgia OKeeffe exhibit at the San Diego Museum of Art.